Here’s a little something for you stats junkies. The point leader sheet doesn’t have any info about dollar values of cashes or field sizes (it does give the number of times the player made positions 1-5), so there’s no ROI calculation, but I’ve added the break-even median ROI for each ITM value on the vertical axis, just for reference. So here it is. 46 live game players from a single venue in town over most of a month. The median number of games played is 21. The median number of games in the money is 6. The median cash percentage is 24% (yes, that’s different from the games ITM/games played; that’s statistics for you). The sample size is relatively small in terms of games played, but you can see a definite progression downward to the mean as the number of games increases. A couple of late cancellations for the home league left three of us itching for some poker, so we headed over to PPC for the Deepstack tournament I never get to play. DV, KB, and I got seated one at each of the three tables. I continued the tight(ish) play I’d determined to hold to on the weekend. The cards weren’t particularly helpful. 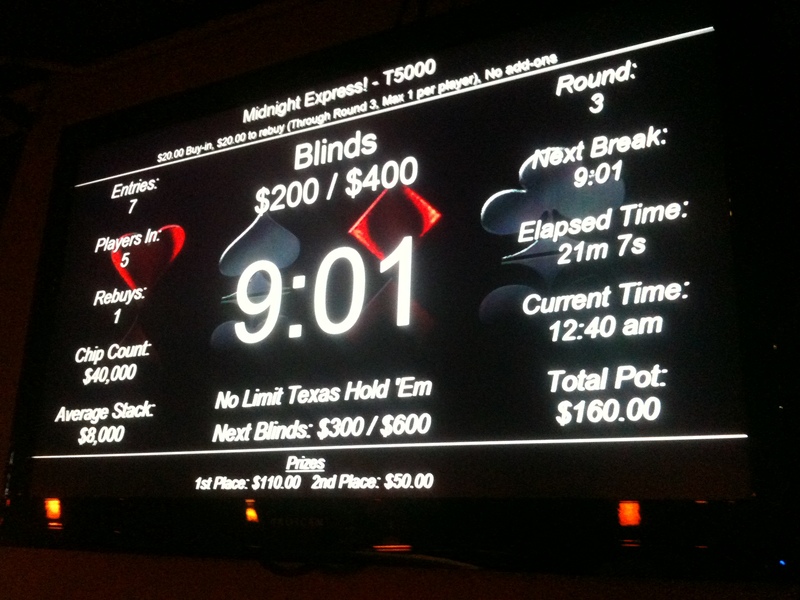 The first hand I played was JxTx; I raised to 150 UTG and got a couple of callers. Qx9x on the flop gave me an up-and-down straight draw, but two clubs on the board made the flush possible. BB bet 350 and I was the only caller. An A♦ on the turn made two straight draws possible, one of which might have come through with the river 3♦. BB bet out 1,200 and I had nothing, so I laid it down. Even though I had a relatively quiet first level, I was down by nearly 1,000 at the end. On BTN with Jx9x , I called with two limpers ahead of me and the blinds in the hand. The flop was a rainbow Jx5x6x and SB bet 150. There were three calls and I used my position to pop it to 600. Everyone folded. On SB at 50/100 with KxQx for the second hand in a row (the first flop hadn’t contained a card higher than 5x), I raised to 300 and got three calls. The flop gave me top two and everyone checked to me. I bet 1,200 and took it without argument. J, at the end of the table had amassed the beginnings of a truly massive stack and was playing lots of hands. I picked up 5x5x and we were heads-up for 150 chips each. The board got progressively worse for me, not quite giving me a straight but with four over cards; J ratcheted the bet up by 50 each street, so at showdown when he declared my Tx was good, even he was surprised when his 4x6x won with the paired 6x on the board. With my other pots, I was up a few hundred by the end of the second level. 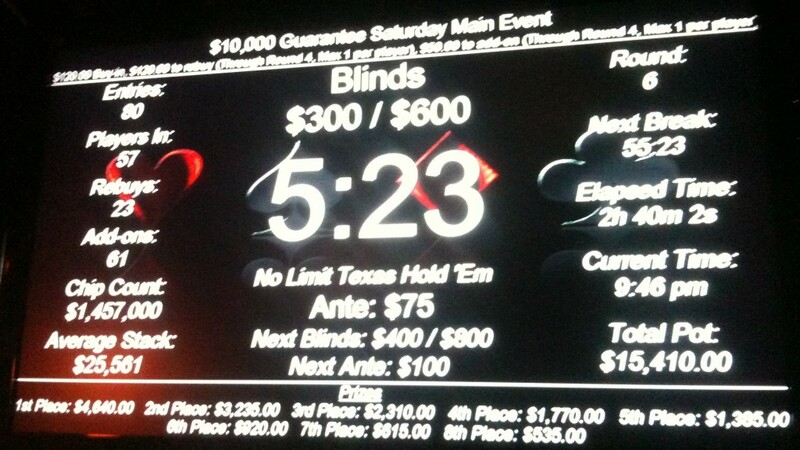 I didn’t play any significant hands during the third level, but my stack dropped 700 chips from blinds and min-calls. 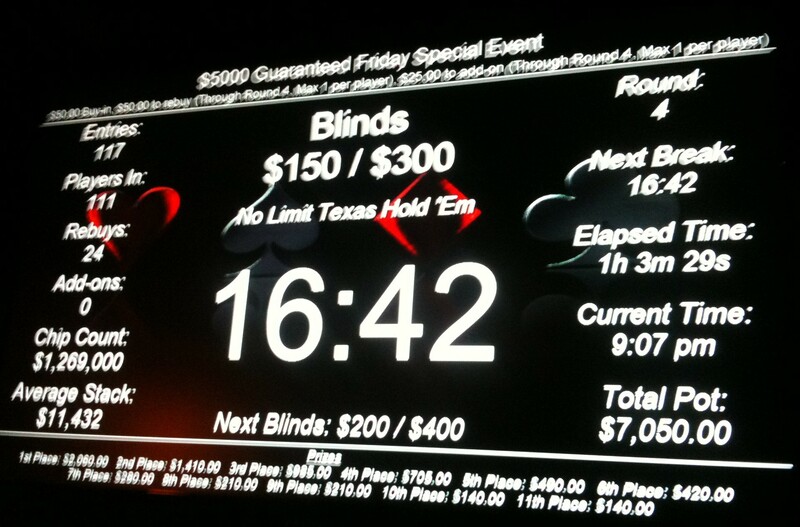 Decided to play KxTx UTG and min-raised at 150/300. The flop gave me a Broadway draw but the board was pregnant with flush possibilities. I called the final 400 knowing my king-high was beat by aces. Managed to semi-bluff three players off a Jx8x7x flop from the BB holding Qx9x. Then a couple of hands later I was dealt A♣K♣ as BTN and raised, getting 2 callers. The flop was Ax7x2x and I bet to win the pot. Called off 1,200 pre-flop with J♠T♠. The flop was low and diamondy; I tossed my hand at the first sign of a bet. By the end of level 4, though, I was back up over the starting stack, finally. 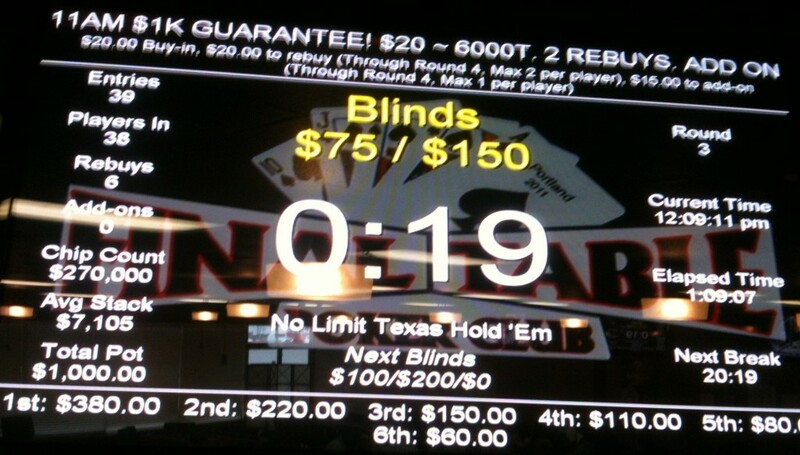 Entered the fray with J♦8♦ at 200/400 and by the turn I had a flush with the potential for a straight flush. I called an all-in from a player whose stack was just about my size and the flush held against his two pair. Raised 1,400 from CO with AxKx but missed the flop and folded to a bet. With the near-double-up, I was up to 16,475 chip at the end of level 5, but there were a couple monster stacks at the table. I automatically folded 8x3x from SB. Two players went hammer-and-tongs pre-flop, I would have made two pair on the flop, and I could have taken the entire pot with a full house on the turn. A pair of nines won. But who’s going to call off 15% of their stack pre-flop with 83o? We were at 400/800. I had Ax8x in BB and I had a single caller. The flop fell around the eight for an up-and-down straight draw. I let him bet 1,000 and called. We both checked the turn, then the river put down an Ax. I bet 1,000 and took the pot. 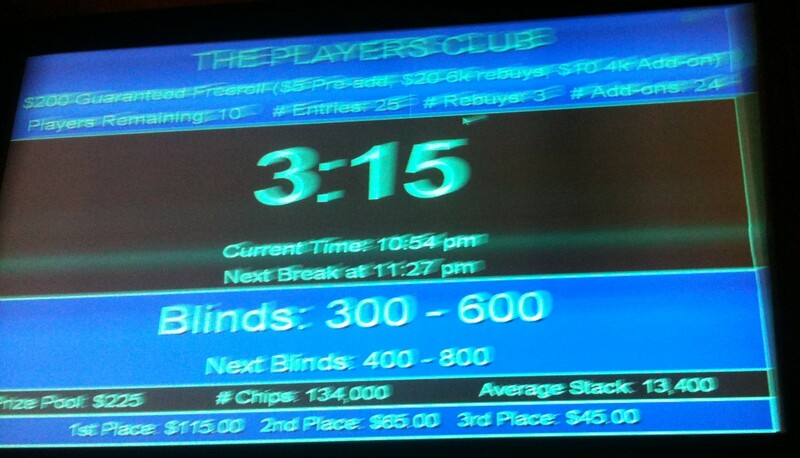 Got into a bidding war that cost me over 7,000 chips with my T♣6♣ flush against a 9x5x full house. That knocked me down to 10,600 by the second break. 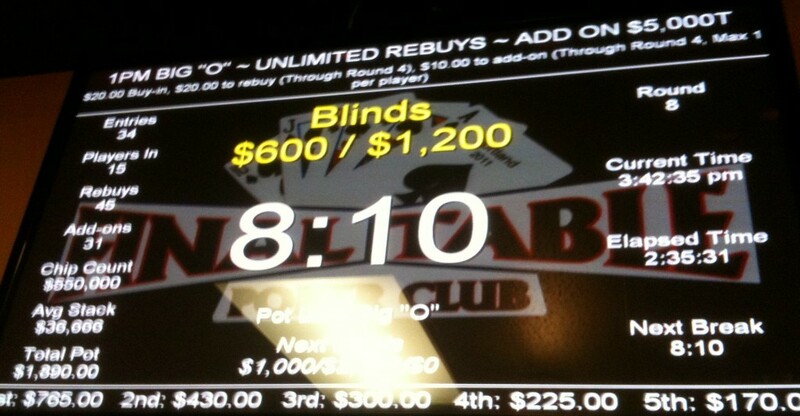 Played K♥6♥ from UTG1 and was heads-up against BB. 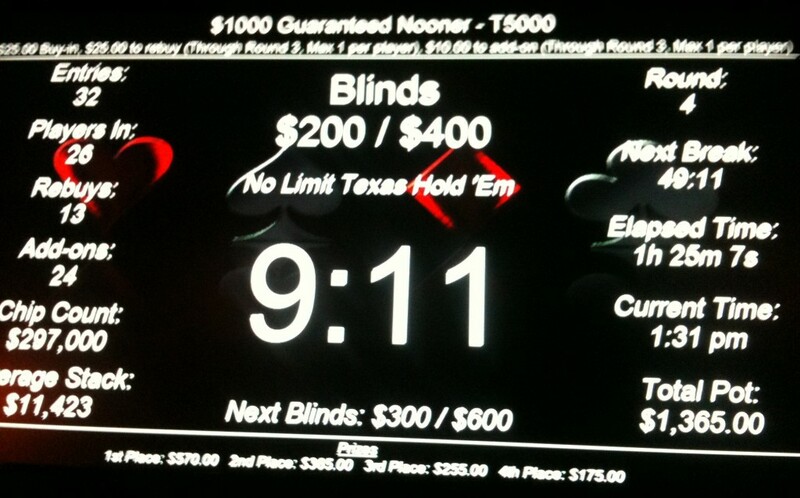 The flop was Kx9xTx, he checked, I bet 1,000. We both checked the Tx on the flop. 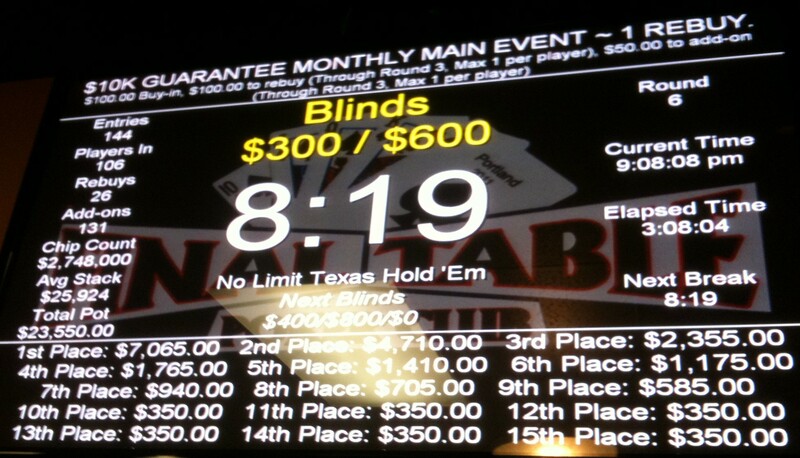 The Kx on the river gave me the nuts and I raised to 3,000 after he bet 1,000, inducing a fold. Raised to 1,800 with Ax9x from CO. BTN re-raised to 3,000 and I called. The flop was nine-high and I shoved. BTN called and flipped AxQx. The turn was Qx and I lost another 7,100. I was down to just 2,500 chips on the last hand before blinds went to 500/1000. I was UTG and looked down at 4x4x. I announced my all-in with a not-very-scary stack and waited for the end. Two callers flicked specks of chips off their giant stacks, then the other two fours hit on the flop. and I more than tripled up. 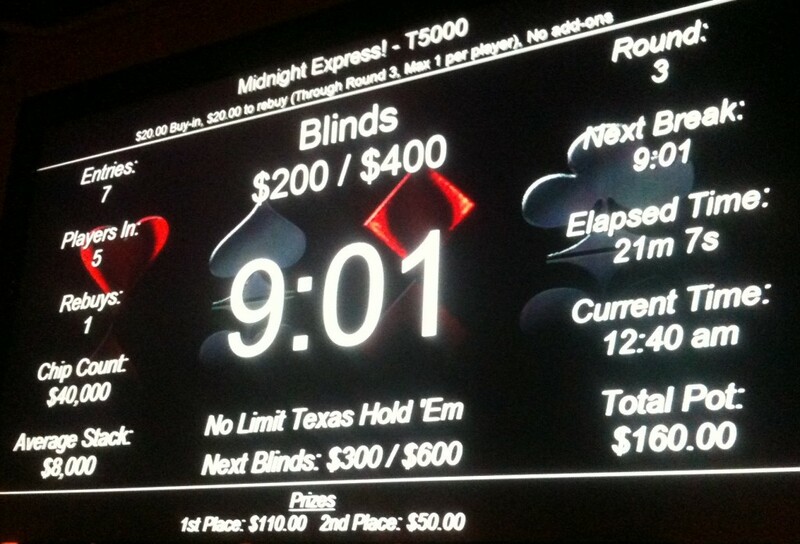 JxTx cost me another 1,000 off that stack from BB when I called a min-raise. Shoved with AxQx and missed everything. I outlasted DV and KB by an hour or so. Three hours and ten minutes. -100% ROI. 15th of 24 players. I was knocked out of the Deepstack just before the first break in the nightly freeroll so I popped over to one of the two tables running there. My first hand was T♣9♣ and I made a queen-high straight, knocking out one of the players and putting me up to 9,800 (from 4,000 starting stack with the pre-add-on) as we headed into the break. I called two all-ins—the largest of which was 4,000 chips—with J♦9♦. I was in bad shape; the larger of the two stacks had J♠T♠ and the smaller stack had one of each of our low cards with the hand that had just made me a lot of chips: 9♣T♣. A jack on the flop and two clubs put me behind both of them, with only a 7% chance of a win (I actually had a better chance to chop). The small stack went away; the winning player was out in the next hand. One of the regulars I’ve gotten to know, DL, was sitting on my left. He called my AxJ♦ all-in with JxJx and it looked like I was done but I drew to a diamond flush. He was on a self-imposed vow of silence at the table or I expect some choice words would have been heard. Playing 9♣2♣ on BB, I made the flush on the turn and won another hand. Then I lostg 8,000 chips with Q♣9♣ going all-in after a queen-high flop that was called by a smaller stack holding 7x7x with a set made on the board. Shoved again with Q♥9♥ and DL called me once again. Once again, he got the short end of the stick, when my queen paired to beat his K♥J♥. He even had my suit. I was out on the next hand with 5x5x from BTN. I shoved my remaining little stack (small even after the double-up) and BB called me with 8x8x. No suckout on that hand. DL was out the next hand himself; I gave him a ride home. Forty minutes. -100% ROI. 11th of 25 players. Looks like I’ve got some serious catching up to do. Here, first of all, but really at the tables. 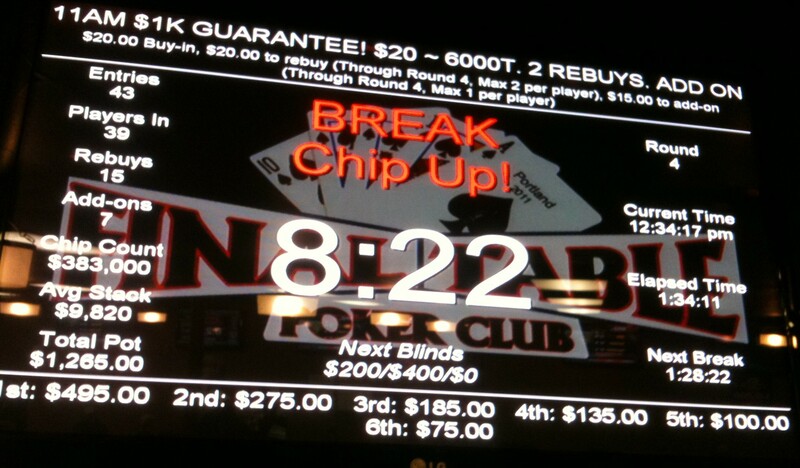 Another one of those PLO8 experiences where you get a wad of chips early on only to lose them, re-buy (resolution broken again), make it to the add-on break, then bust out half-way through the first round after the break. Eighty-five minutes. -100% ROI. 26th of 28 entries. In the interests of getting this update done, not going to bother with a hand-by-hand for this brief game. Thirteen minutes, 15 hands. 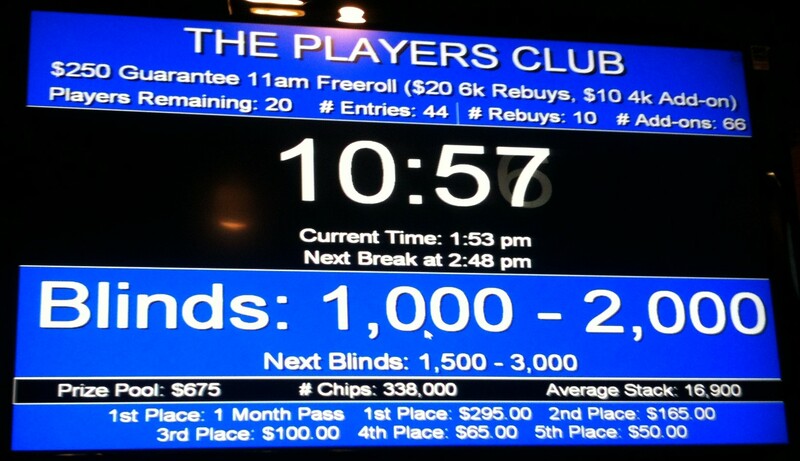 2,566th of 2,798 entries. Didn’t rebuy. First player permanently out. Sixty-five minutes. -100% ROI. 39th of 39 players. I hadn’t played Big “O” as a tournament before this, but I’d been intrigued by it and my early exit from the $1K Guarantee gave me the chance to give Final Table’s alternate Friday early afternoon game a try. I did reasonably well, I think, except for the part about not making any money. Two-and-a-half hours. -100% ROI. 16th of 34 entries. It’s the game I was waiting for. Didn’t make it as far as the second break. Three hours. -100% ROI. 107th of 144 players. 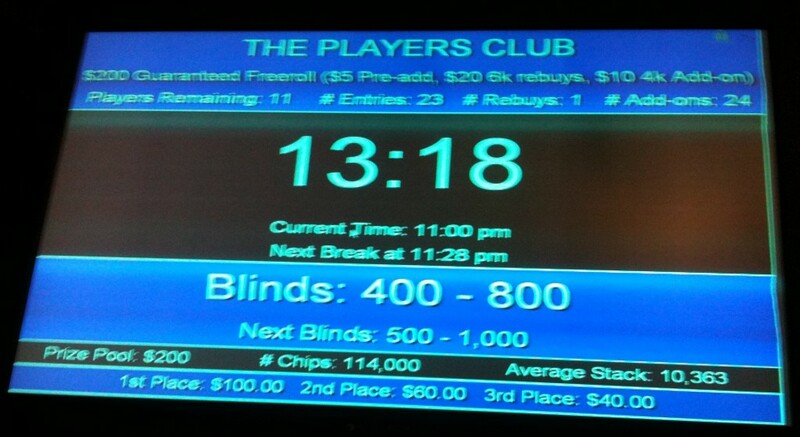 Wandered over to PPC after I got booted from the $10K. 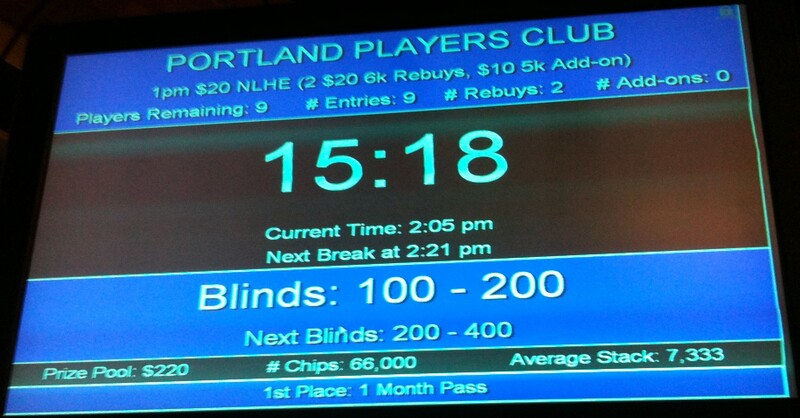 Came in a few minutes late but started to pick up chips and made it to the bubble. Dropped my median ROI by a bit. Two hours. 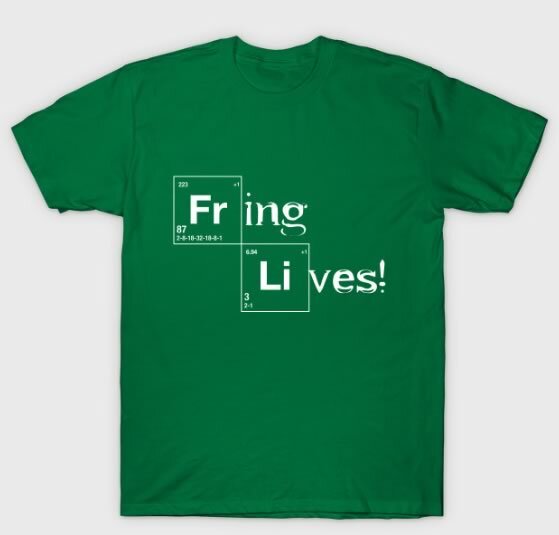 +0% ROI. 5th of 24 entries. It was the first anniversary of the new regime at PPC and CB had a bunch of prizes added to each of the day’s tournaments. The early game had a month’s pass added to first place; I only made it about half-way through the field. Two hours and fifty minutes. -100% ROI. 21st of 44 entries. Slid over to the well-in-progress second tournament of the day. I did not last long. Ten minutes. -100% ROI. 9th of 9 players. Couldn’t play the later PPC events on their anniversary because of the home league game. 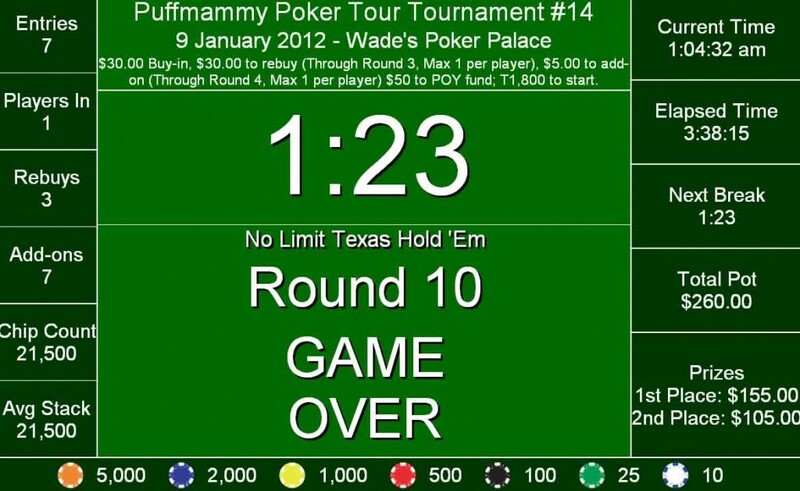 Busted out twenty minutes into the tournament after I was out-kicked by WA. Re-bought (resolution doesn’t apply to the home game), then busted the next two players myself within an hour. Several reversals of fortune happened: I ended up in second place to JT, the first of the players I busted out. The two payouts went to two of the three players who re-bought. Median ROI dropping like a rock. Three and a half hours. +62% ROI. 2nd of 7 players. After the home game, I headed up to Woodland to see if I could get into some Omaha but there wasn’t anything going. Played spread limit for the first time. Two hours. +8 big blinds. I’d really like to play the noon game at Aces more often but it’s just gotten so large that I can’t make obligations in the early evening if I go deep. Not that I did here, but I don’t plan to go home early. One hour and fifty minutes. -100% ROI. 30th of 44 players. This was my first big game at Encore for the new year and I managed to hold on through round 12. I avoided a nasty encounter on the last hand before the second break that would have busted me; my hand was strong but wouldn’t have won. By the fifth hour, I was up to more than 125,000 chips; more than half-again the chip average at that point. Then in the middle of the hour I lost all but 16,000 of it in a hand I can’t recall at this time but likely one of those scenarios where I probably shoved incorrectly. I was out less than two minutes later. Five hours and fifteen minutes. -100% ROI. 24th of 112 players. This is usually a money hole for me, but surprisingly I came out on top for a change. A couple good hands of Omaha made my day. Four hours. +50 big blinds. 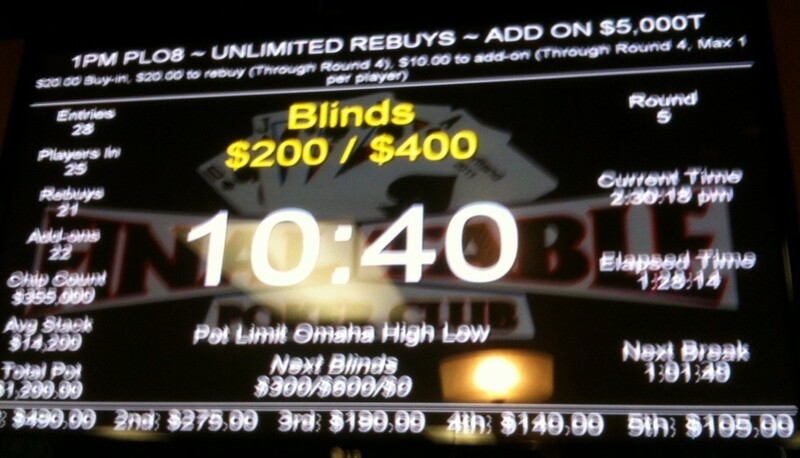 In my constant search for Omaha action, I drove up for one of the morning tournaments. I have to say, the lack of info screens, low number of chips, and the small size of the field doesn’t really make it worthwhile for me. Two hours. -100% ROI. 10th of 28 players. Nothing like a late-night game at PPC. I mean that quite literally. It can be sort of crazy when people who bust out can re-buy and immediately have more chips than your stack after you busted them. Two hours. -100% ROI. 11th of 23 players. Another game that ended for me half-way through the round after the add-on. Got my double-stamp for the day, though. Eighty-five minutes. -100% ROI. 27th of 32 entries. Didn’t even make it to the add-on in this game. One hour. -100% ROI. 112th of 117 entries. I had an hour after the $5K before another tournament started. I figured Oak Tree might have some Omaha running on a Friday night and I headed up there instead of waiting. Big mistake. I’d forgotten about their grand opening celebration, they were giving $500 away each hour in a drawing, and every table was packed. Every waiting list was packed—except for 15-30 HE, and even that had a waiting list—there was only one Omaha table, and I was about #15 on the list. As it was, I could have made it back to Encore before anything opened up. I went in on a table, made a little bit, lost a little bit, then players started drifting away after the last drawing of the night and it broke. One hour. 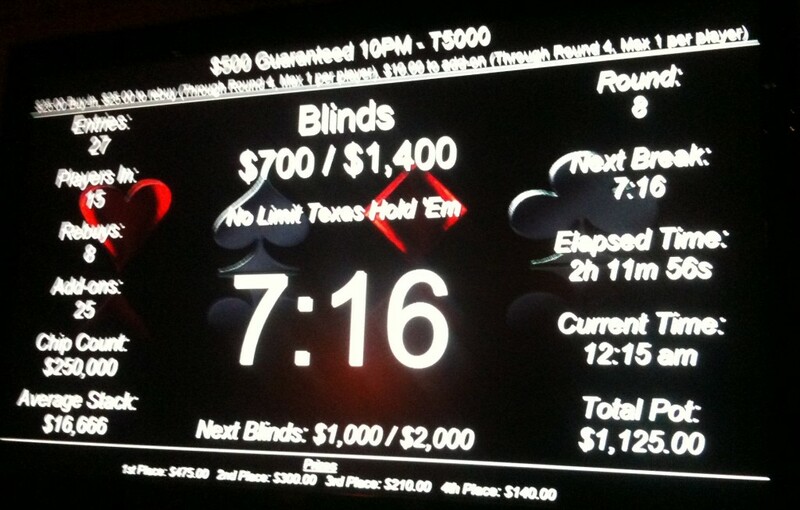 -10 big blinds. I took a seat at this table despite my best judgment. One hour. -130 big blinds. If you’ve made it down this far you know that it’s been a little while since I posted a win. More importantly, it’s been a while since I posted a substantial win. Surprisingly, my In The Money (ITM) percentage hasn’t faltered much; although there are a lot of games listed in this one post, they were played over a period of three weeks and represent a fairly small number compared to the total number of tournaments in my database. But I can’t live forever on past winnings. 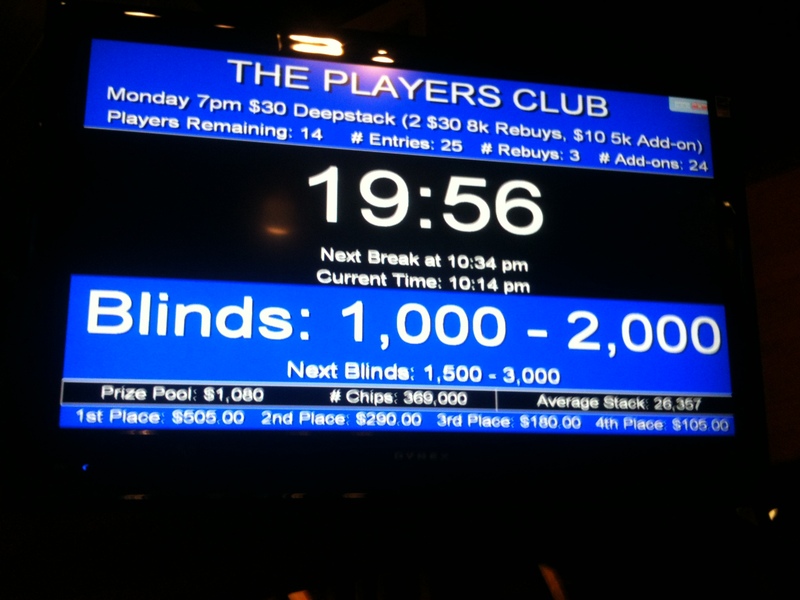 So I resolved to play this past week’s $10K at the Encore very tight at the beginning. It didn’t help much. 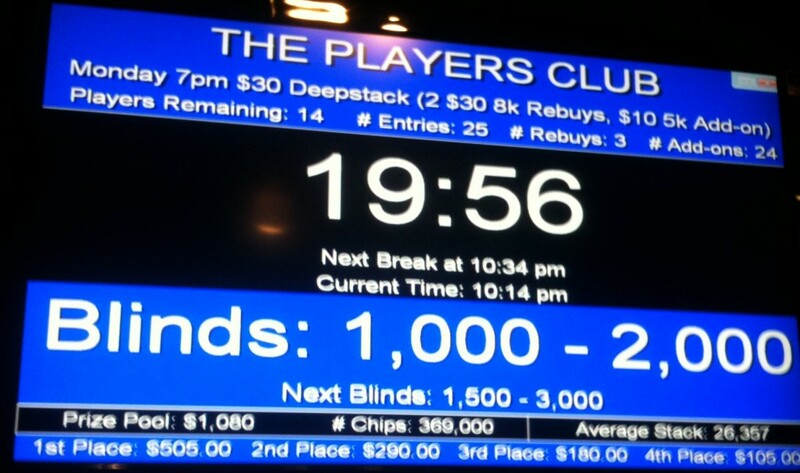 Before the first break, I was down to just over 20% of the starting stack. I did manage to chip back up to 7,500 by the break, then did the add-on, but it was rough, as the most premium hand I’d gotten was TxTx. Then, in round 6 on my big blind, I looked down at QxQx and decided to go for it. 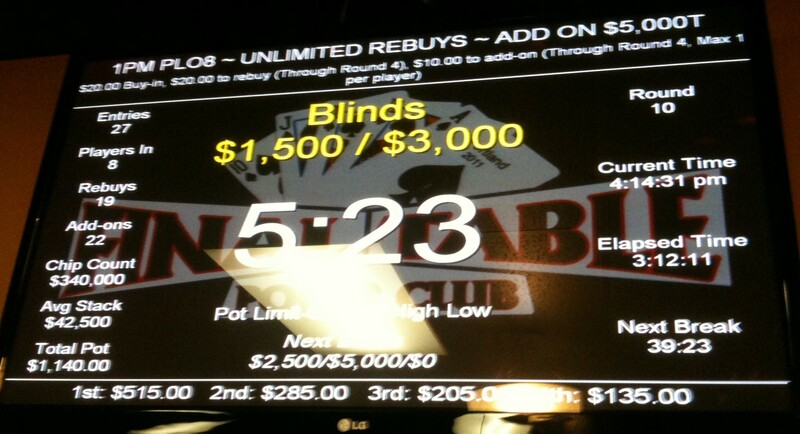 UTG raised, there were a couple of calls, and I shoved with about 10,000 chips. 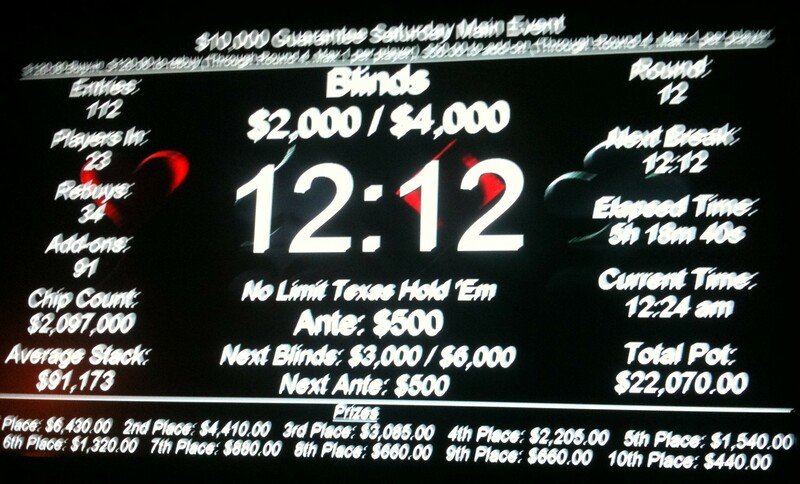 Everyone folded but UTG, he flipped KxKx, they held, and I was out. Three hours and forty minutes. -100% ROI. 58th of 80 players. Hung around the club this time for the next game. Don’t remember much about it. Maybe I’m going to start keeping notes again. Two hours and ten minutes. -100% ROI. 16th of 27 players. Not a big field. Not much money. Not a very good showing. At least I didn’t re-buy. Twenty-one minutes. -100% ROI. 6th of 7 players. So, a couple weeks of garbage in there cleaned out. On the definite up side, though, a shout out to reader DS who came up to me between games at the Encore on Saturday and said hello after she’d spent a little time to figure out just who the Poker Mutant is (it’s not that difficult now that I’ve grown my beard back). When someone with more success than you have takes the time to say hello, you really can’t complain. Speaking of which, this next week I get to host a visit from a WSOP bracelet winner and someone who was in the top dozen of the Bluff 2010 Player of the Year list (they’re the same person). Did well getting a double-up just before the break, but lost a few hands and went out on my big blind with unsuited 7x5x in a desperation move. Two hours. -100% ROI. 30th of 44 players. Most of my session here was down and up. Got cut to 40% of my buy in a couple of times, made it up to 140% once and over 120% another time. After the 10-20 table behind me closed, a guy acting like a retarded cowboy showed up along with a couple of others. I dropped out of a pot heads-up against him on a ace-high flop where I had bottom two. Another ace showed on the turn, he bet and I folded, then he rolled over a couple of middle-rank hearts to rub it in. That should have given me a clue later when I had a 9♣6♣ flush draw on the flop. There were three players in (including the retarded cowboy), a kill pot was active, and by the time we got to the river, I was down to about 20% of my buy-in. The pot was huge, there were a pair of threes on the board, I didn’t even have a pair, the third player was all-in on the turn, and the cowboy bet. In retrospect, with that much in the pot, I guess I should have called even if it almost felted me, but I had nothing and folded. The cowboy had 2x5x and the all-in player had 8♣5♣, winning the whole thing with an eight high flush draw that I would have bested if the third club had come through. It wasn’t actually Friday the 13th any more by the time that hand went down, but it sure felt like it. Two hours. 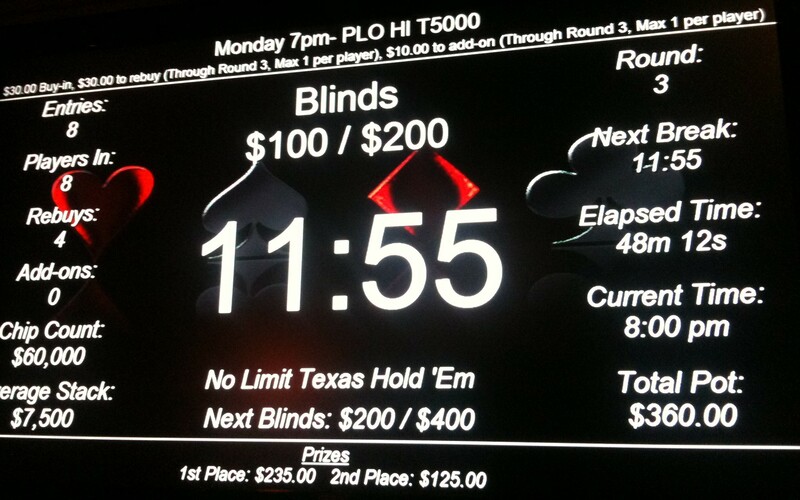 -25 big blinds. Since my concentration on live tournaments after missing out on my home league’s Player Of the Year WSOP buy-in pool and Black Friday’s crushing of the online poker action in the US, I’ve played 169 tournaments, mostly at Portland-area poker venues. Make it to the WSOP. I hoped to put together enough between 1 May and mid-June to make up for missing out on the POY pool, so I could play one of the low-end WSOP events and visit with Tomer. Two early wins at the PPC right off the bat gave me some hope, but times were tight, I had to dip into my poker bankroll for personal expenses, and June slipped away before I made it up. Make it to Prague. My next goal was to make it to the EPT event in the Czech Republic that started on my 50th birthday. Prague’s supposed to be a great place to be just before Christmas, I could take Ms. Poker Mutant with me for part of the trip, we’d make a little European vacation of it, and maybe I’d get lucky. Problem was, I figured I needed about $20,000 for travel expenses, the $7,500 EPT buy-in, and some money for side events that might make the trip worthwhile, poker-wise. Kept coming up waaaaay short until a win just a couple of weeks before I needed to be on my way made it possible—if unlikely—to build the roll up. No luck, but I tried. I’ve played an average of 21 tournaments each of the last eight months. Thirty-one of those have been games where the buy-in was $100, $120, or $150. I played three tournaments at Foxwoods. And—briefly—the $2,500 Venetian Deep Stack Extravaganza IV at The Venetian. I’ve made the final table in two of the seven $10,000 guarantees I’ve played at the Encore Club, placing 8th in a field of 142 back when they were monthly, and taking first in a field of 75 since they’ve gone weekly. I also took second in their 138-player Tournament of Champions back in August. 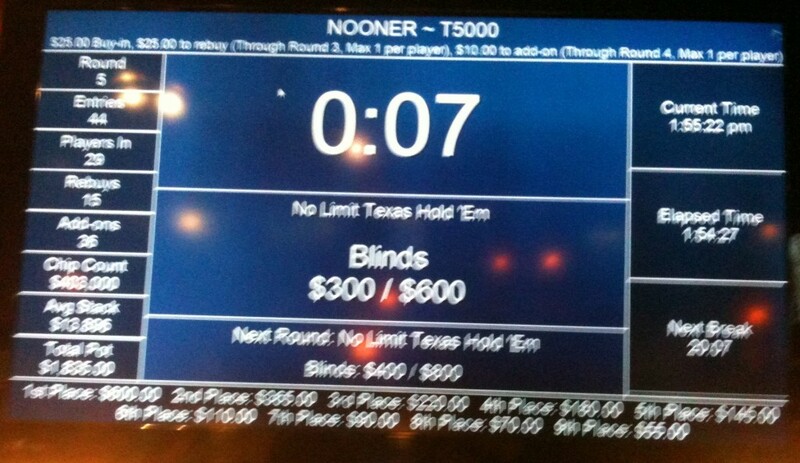 Got to play 2-7 Triple Draw the other day with a guy who was a hair’s-breadth from winning a WSOP bracelet. So even though my main goals were thwarted, not a bad year for the Poker Mutant.